The Hill Country can be roughly defined as the region stretching 100 miles west from the cities of Austin (in the north) and San Antonio (in the south)—though Tim pointed out that some Texans might beg to differ on where the region begins and ends. One thing is for sure—the ocean that once covered the region receded and the seafloor rose eons ago, and the limestone hills that define this region of central Texas and the aquifer that provides the lifeblood for its waterways began to take shape. There are a number of rivers that anglers can explore here. The Llano, , the San Marcos, and Devils Rivers are a few of the attractions for fly fishers. Each has its own character: The Llano courses through limestone and sandstone canyons, where raptor life abounds. The San Marcos flows through farmland and is lined with live oaks and old growth cypress trees. The Devils is perhaps the wildest river in Texas, running crystal clear through countryside that alternates between stark canyons and wooded hillsides. Though the Guadalupe River, also in the region, is the southernmost river in the United States to support a trout fishery, it’s the warmwater species that attract most visiting anglers—largemouth bass, smallmouth bass, and a fish peculiar to Texas, the Guadalupe bass. RESOLVED, That the 71st Legislature of the State of Texas hereby designate the Guadalupe bass as the state fish of Texas. “One of the five most memorable days of fishing I’ve ever had came on the Llano River,” Tim shared, “though it did come with a cost: a disease called bass thumb. 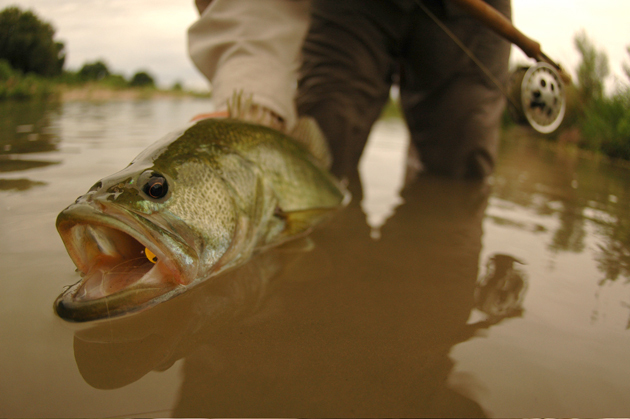 The affliction affects the epidermis on the distal phalanges after repeated releases of largemouth and Guadalupe bass. Fishing with Johnny Quiroz, a photographer friend (who also does some guiding), I had a single yellow popper that I fished for the entire day. I must have released fifty fish. At the end of the day, Johnny inspected my thumb, which looked like it had been worked over with a belt sander. ‘You have bass thumb,’ he said. Tim Romano is a fine arts photographer, managing editor of Angling Trade and a frequent contributor to Field & Stream’s Fly Talk blog. He was formerly an editor with Fly Fishing Trade and Wild on the Fly magazines. Assignments have taken him to Alaska, Chile, New Zealand, Russia, and the Bahamas, to list just a few of his travels. Tim’s artwork is part of the permanent collections at Lake Forest College, Photo Americas Portland, Instituto de Artes de Medellin, Colombia, and the University of Colorado, Boulder. In 2005, Tim founded Guide for the Gulf to benefit fly-fishing charter captains impacted by Hurricane Katrina. He earned the award for Cover Design Excellence from the College Designers Association and has many magazine covers to his credit. He lives in Boulder, Colorado. Prime Time: Fishing is open year-round in Hill Country rivers. Most fish best in the spring and fall, though on some systems, fishing can be good through the summer. Getting There: The Texas Hill Country can be easily reached from either Austin or San Antonio, which are both served by many major carriers. Accommodations: When visiting the Hill Country, Tim often stays in the music and barbecue hub of Austin, and the Austin Convention & Visitors Bureau (888-463-0211) outlines lodging options. If you’re fishing on the Llano, Tim recommends Raye Carrington’s (866.605.3100), a B&B right on the banks. Outfitters/Guides: Johnny Quiroz and Marcus Rodriguez (956-802-1157/512-665-3261) guide on several of the region’s rivers and can give you a good case of bass thumb. Davis Fly Fishing Guide Service (512-557-4128) also knows the waters well. Equipment: A 5- or 6-weight rod rigged with floating line will work for most situations. A regular assortment of bass flies—including Poppers, Woolly Buggers, crayfish patterns, attractor drys, and baitfish patterns—will all work in the Hill Country.